Ray Piltz on the #37 just before his last run. Peter Replinger photo. 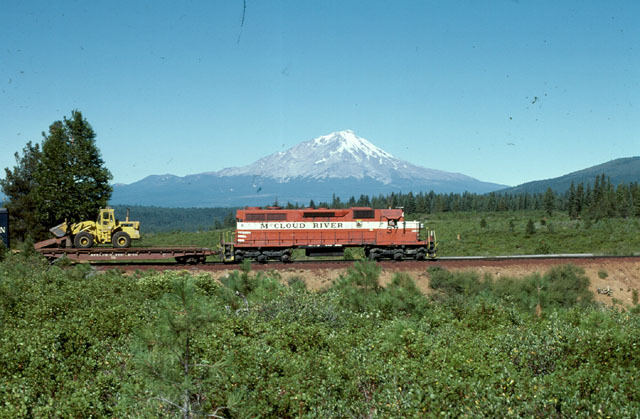 Ray Piltz hired out with the McCloud River Railroad in the late 1930's. 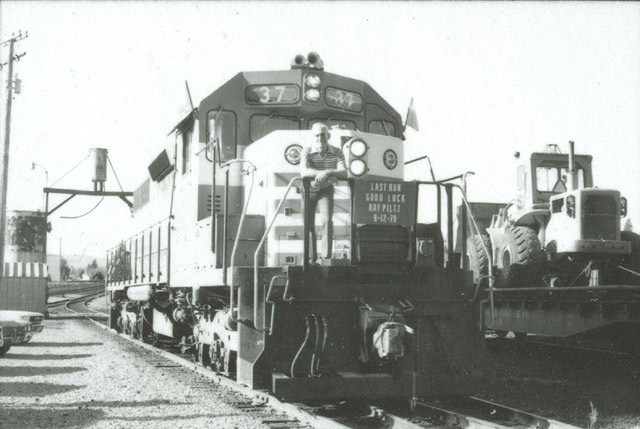 Except for some time off for military service he spent his entire working life with the company, almost all of it in train or engine service. 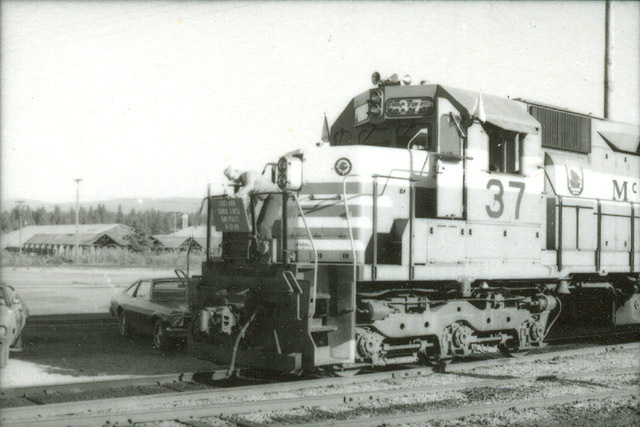 Ray became very well known in the railfan community through the 1960's and 1970's. Visiting fans always found him to be warm and welcoming. 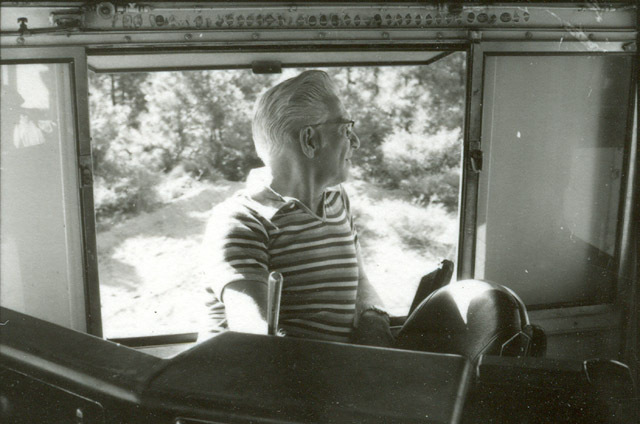 Ray was a strong student of McCloud history, and he had an encyclopedic knowledge of the operation. Ray put in 39 years with the company before entering retirement. 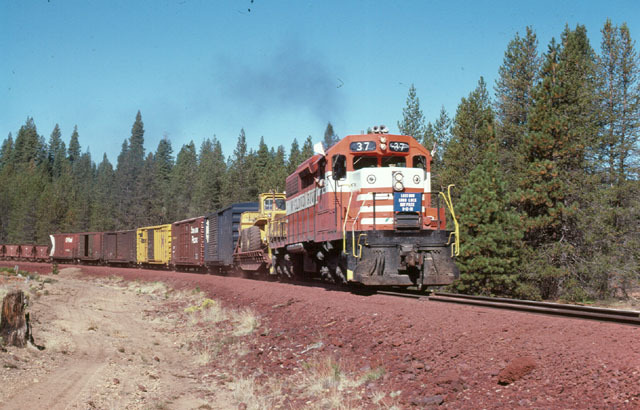 His last run proved to be a Lookout Job on 12 September 1979. 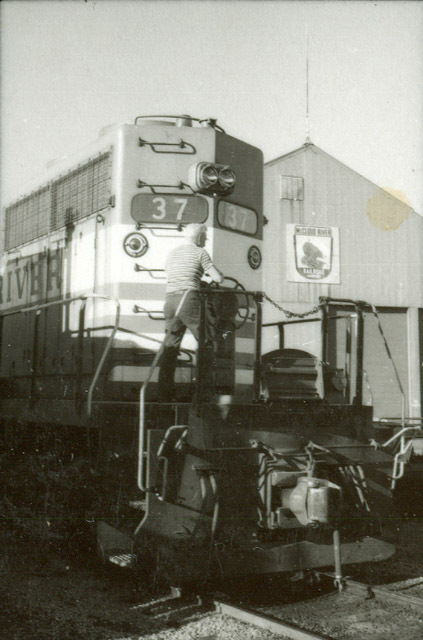 Locomotive #37 did the honors, and it was specially outfitted with a K-3 type air horn, flags, a Mars light, and a special sign created by friends and fellow employees. Ray continued to live in McCloud, and even came out of retirement to run the #25 in the 1980's. Ray passed away in December 2002. He is greatly missed by the many who knew him. 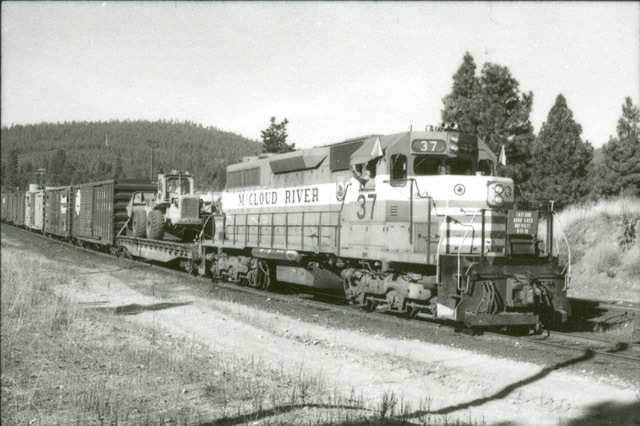 Peter Replinger, a long-time engineer on the Simpson Timber Company logging railroad out of Shelton, Washington, was on hand for Ray's final trip. All photos on this page are by Peter and are used with permission. 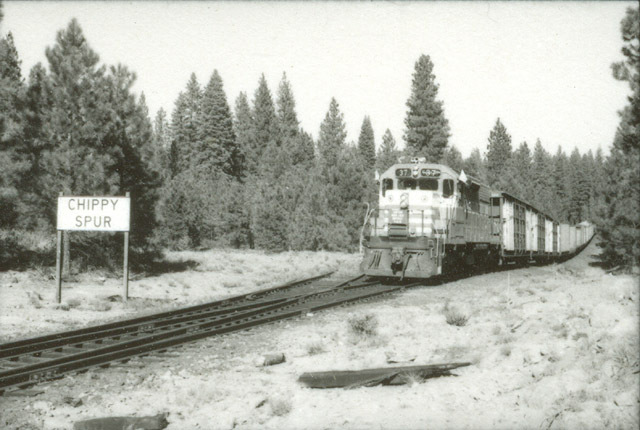 Ray waves from the cab of the #37 as the train leaves the McCloud yards. The train rolling out of Nebraska Curve. 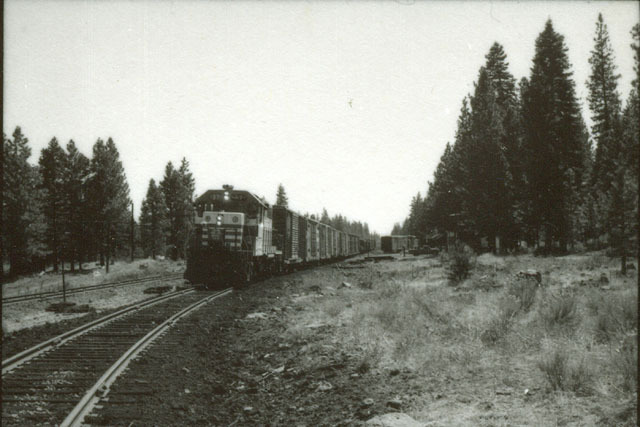 The eastbound train consisted of six boxcars bound for Lookout Junction and seven company cars bound for the ballast pit at Porcupine. Ray in his office on the last day. 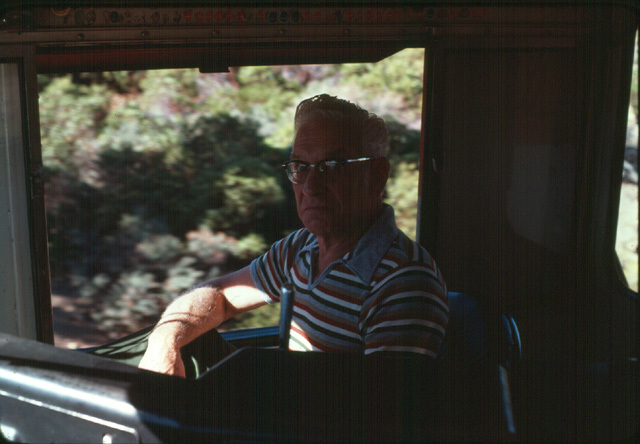 Another shot of Ray at the controls of the #37. Note that the cab roof above the engineer's seat is filled with fruit stickers. Ray added one on every trip he made, and woe be it to any other engineers that tried to add to- or remove any of- Ray's sticker collection. The #37 framed below Mt. Shasta in the McIntosh Vista area. 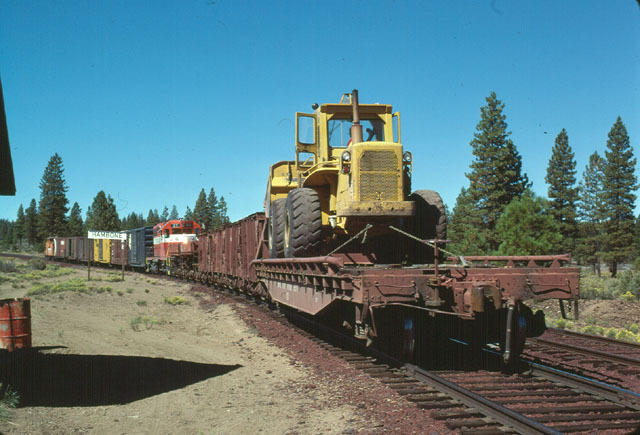 The train paused in Hambone to switch the seven company cars- four bottom dump hoppers, two side dump hoppers, and a flatcar carrying a loader- in front of the locomotive. The crew did this to simplify dropping the cars off at Porcupine. The train is reassembled and is ready to head east from Hambone. Ray was well known for taking a pocket watch carrying a BN logo out as trains left Hambone to signify that he was now on "mainline rails". 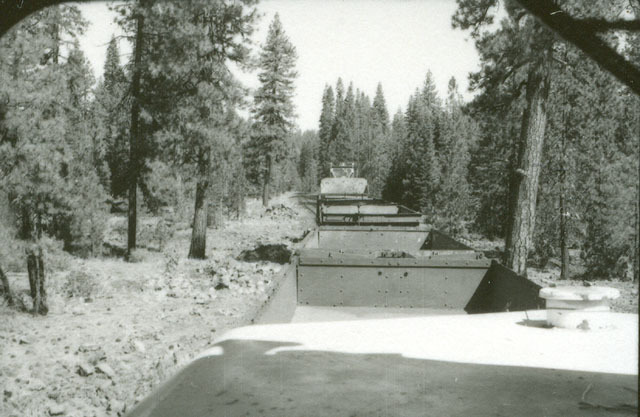 Looking forward from the cab of the #37 as the train pushes the ballast hoppers and loader somewhere between Hambone and Porcupine. The train switching at Lookout Junction. 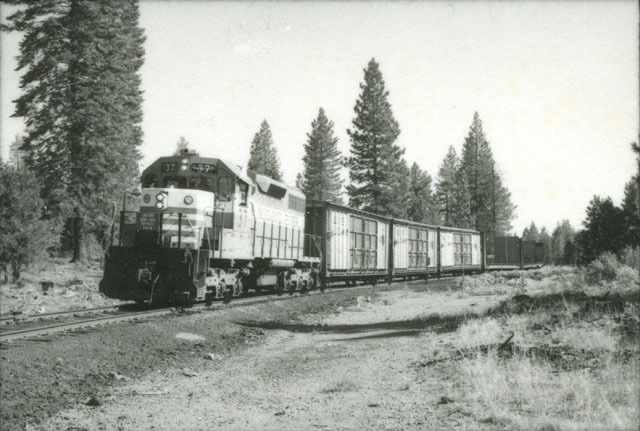 The train has completed switching at Lookout Junction and has started the return trip to McCloud. 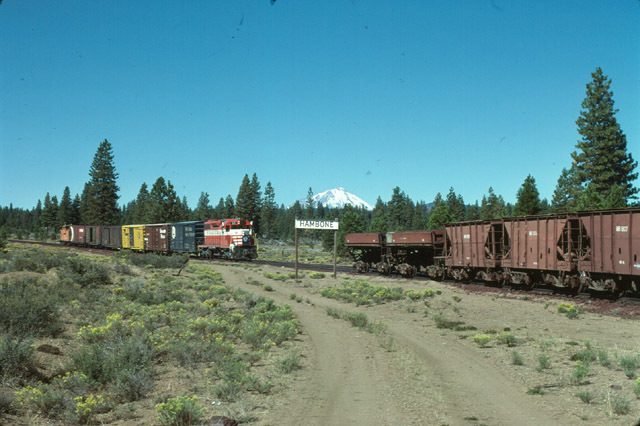 The first three cars in this train are boxcars re-built from all-door cars. Ray's last train passing Chippy Spur. Eighteen miles to go in a career. 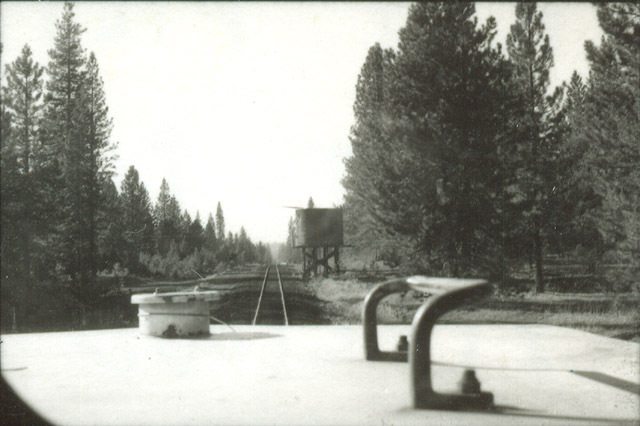 The westbound train approaching Bartle tank. Ray tying down the hand brake on the #37 after arriving back in McCloud. Removing the sign from the front of the #37. Thiry nine years of railroading has come to an end.